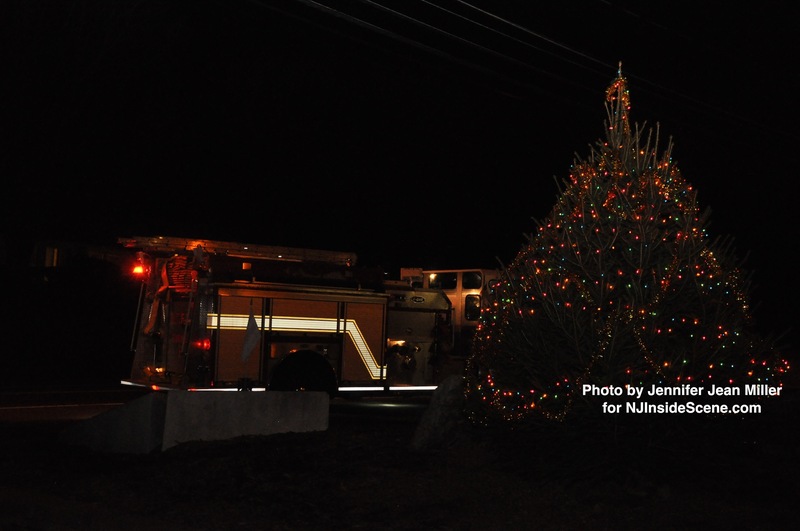 A Byram Township Fire Department Fire Truck parked alongside of the newly lit tree. After an interactive and amusing show by Rizzo’s Reptiles (which included visits from various creatures, from a frog to a hedgehog to a snapping turtle to a massive Albino Burmese Python) then an exciting few moments of anticipation, the children of Byram waited last night, Sun., Dec. 1, around the tree at the side of the Cranberry Lake Firehouse. As they watched, suddenly, the tree was aglow with lights and holiday sparkle. 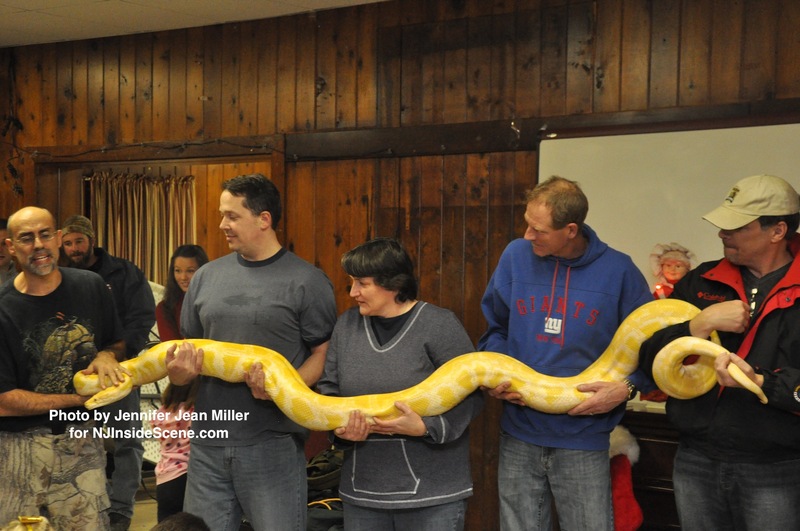 Brave parents help to hold up a python, during the Rizzo’s Reptile Show. 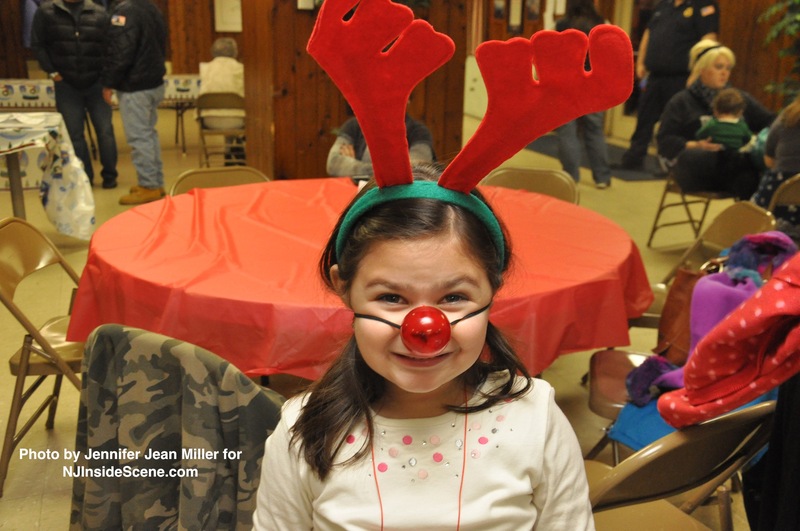 Brianna Kash shows her holiday spirit with her Rudolph nose and antlers. Minutes later, sirens blared from Route 206 North and in the distance, red and blue lights could be seen, as a fire truck raced along the highway. The kids squealed with delight and enthusiasm. Just before the fire department, the engine slowed down. Out stepped Mrs. Claus with a wave, followed by Santa. Santa and Mrs. Claus exuberantly gathered with the children, and were escorted in, surrounded by a herd of young people, as well as parents, from the front and back. At that point, the residents enjoying the festivities spent time together for a meal, and it was time for Santa to meet with the children, and let them tell him their Christmas wishes. 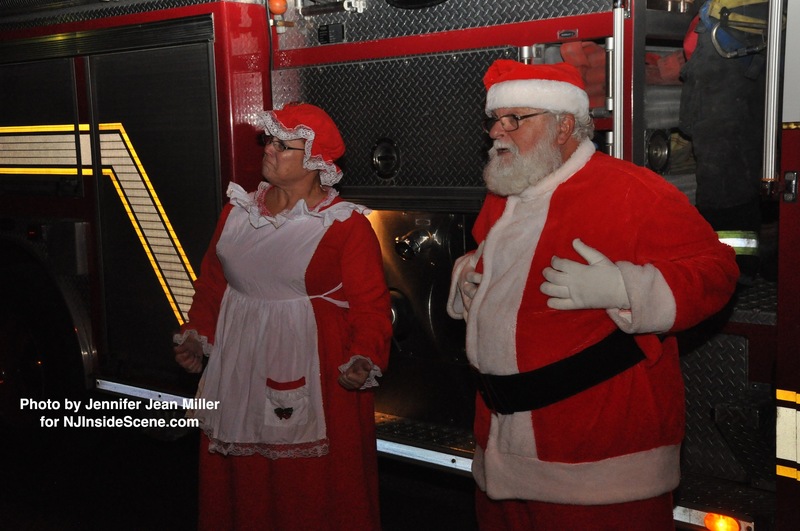 Santa and Mrs. Claus step off of the fire truck. Click the video at the top of this article for highlights of the event. The evening had a solemn undertone, as the residents acknowledged the Risco Family, a township family that lost everything, including their home on Richmond Road, to a devastating fire, the Saturday after Thanksgiving. Both parents suffered significant burns in the fire – the children were not burned. Various efforts are underway to help the family rebuild their lives. While there, donations of clothing and household items were accepted. Donations can be dropped of at 4 Richmond Road or at the Cranberry Lake Firehouse. Unit 1005 at Metro Self Storage (159 Route 183 in Stanhope) is also secured for donations, and items of any kind can be dropped off during the storage center’s normal business hours. The Byram PTA is also collecting donations and gift cards, which can be sent in to the schools, attention to Keri Fleming. 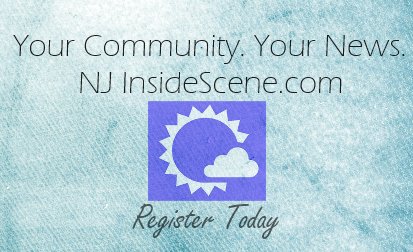 Stay on the “inside scene”…and catch us on Facebook for more “inside scene” stories. Click here!